We just wanted to share this image of some beef ribs that we procured from the House of Beef in Oakdale California. They were sold pre-marinated and cut into individual ribs. We smoked them for 3 1/2 hours with a combination of apple and hickory wood. 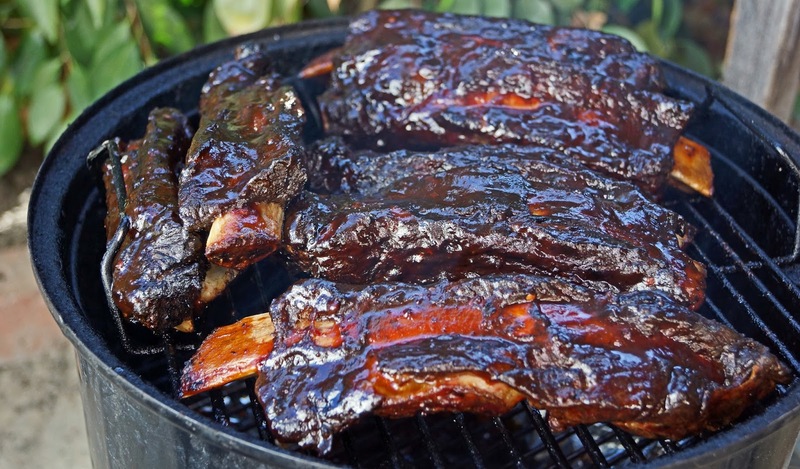 It is a treat to find beef ribs that actually have a good quantity of meat on the bone. They were fantastic. Have a great Columbus Day. Good score - I rarely find any with much meat on them unless it's at a Texas BBQ place. I've said it before and I'll say it again, beef ribs are my favorite. I like to finish them on the grill to set the sauce. Those are looking good Chilebrown. Greg, Meaty, beaty, big and bouncy. Big Dude, I could not pass up these ribs because they were so meaty. I think a road trip to Texas is in order. Three Dogs BBQ, We set the sauce in the smoker for about 10 minutes. Beef ribs are my favorite too so these were a treat.